There are currently 4,316 users on this website. Hello. I would like to know more about this postcard. It looks like a rally or election. I can tell George Washington is on the top left and Abraham Lincoln on the top right. It looks kind of like Stalin on the right. Please help. Are you able to focus in on the Image on the Dais? The flags on the lower frames, would suggest the Tricolor of France, perchance? The chair design should date the card, from those with an antique craft chair bent. 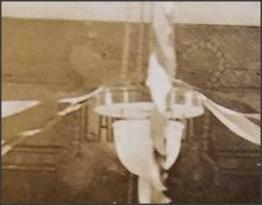 The American flags appear to be 35 star flags which would date them at 1863-65. The image to our left sure looks like Kaiser Wilhelm, whose reign did not overlap with Stalin, which might make the fellow to our right ... anyone! The thought "German American Friendship League" came to mind, but the only flags etc are American. Highest resolution scans of the photos - left, right, and podium - might help. I think the flag actually has 48 stars, which would make it post-1912. The picture at left appears to be Gen Pershing, which would likely make this post-WWI. Maybe a political rally from the 1920s. That would also be consistent with the general style of the decor, photo, card, etc. I agree with Rod. The French flag ang the U.S. flag are displayed. It looks like Gen Pershing on the left and Gen Foch on the right. I would guess that this is a rally in support of France held during or immediately after WWI. Delights me to see Philatelic detectives at work. 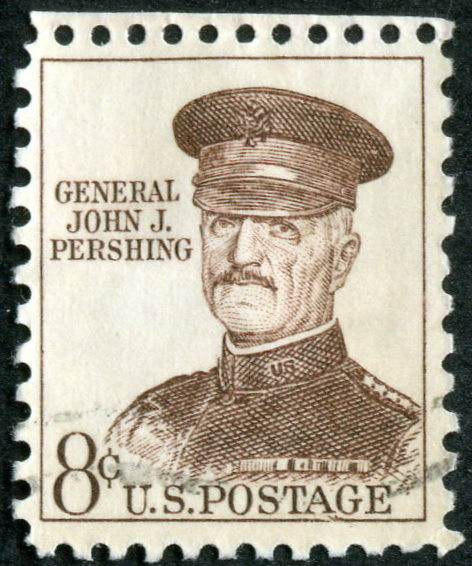 General John Pershing as suggested. Teasingly, there is a name of the venue, Top centre stage, begins with CA possibly. Find it hard to believe I have no image of the gentleman in my database, on Cinderella, Poster Stamp or otherwise. Would this be Gen. Foch? 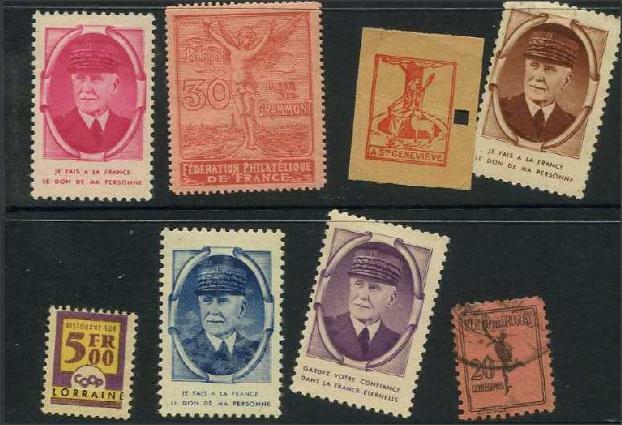 The person in the French military uniform could be Foch, Joffre, or someone else. I can't be sure. The mustache looks a little dark to be either of the two, really. The person in left picture is Gen. Pershing, I am pretty sure. The posture, pose, and his fame in this country make me believe it couldn't be anyone else. Foch (or?) is to the right? Can we see the centered honoree up close? 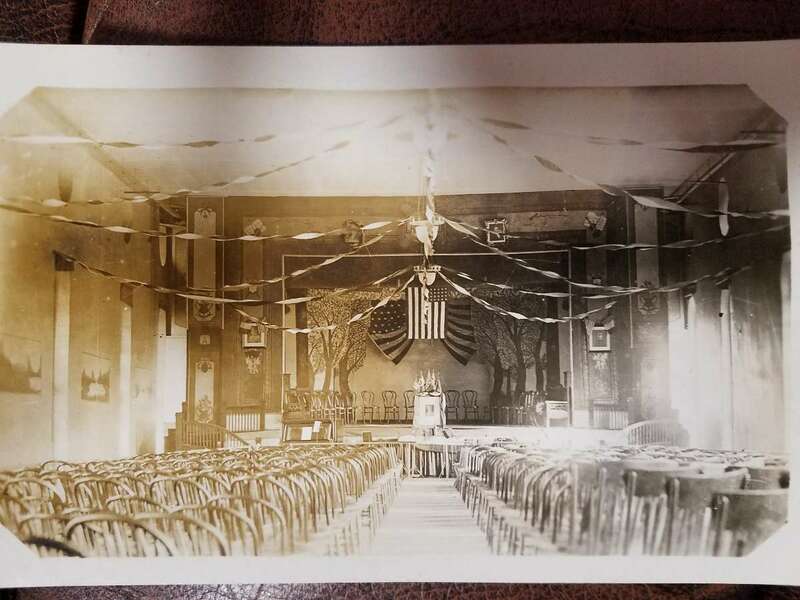 I bet 4th of July 1919 if the centered person is not directly related to WWI - Does the back give any clue or was is sent? Possibly Wilson in the centre? My guess is the First World War, just after the USA came in in !917. I think the guys in peaked hats are US and French high officers. Bent wood chairs were used in the first three quarters of the 20th century. Retail shops I worked in in the 1970s had them for customers. I remember one had a railway company label for the Great Northern railway (English) meaning the chair had definitely been shipped prior to 1923, or perhaps 1925 if you allow for it's successor using up stationary. The cluster of flags on the dais look as though they could be flags of the Allies. Ifthe picture is from Europe then the currency of the flags stars don't signify much, a Stars and Stripes wouldn't get flown much and any would do. 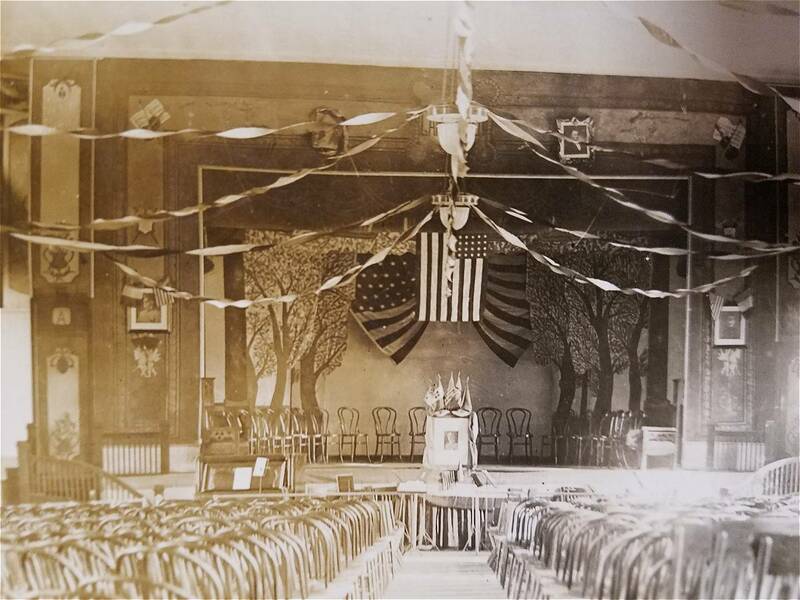 The flag hanging vertically down is the wrong proportion for a real flag and is probably painted by someone who didn't know much, probably the room was never studied so closely as it is being now. Outstanding, thanks for posting, I love this site! It took 0.77 seconds to lick this stamp.